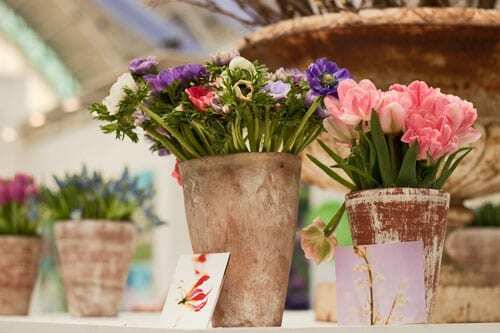 On Wednesday, I attended the Country Living Spring Fair at the Business Design Centre in London and today’s blog post features my floral highlights. 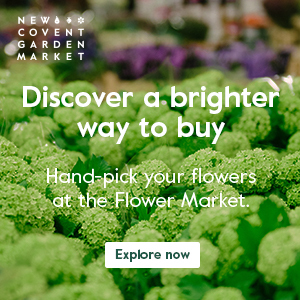 Over 400 designers and producers from around the UK exhibit at the show and it’s the perfect place to find ideas for your home and garden. 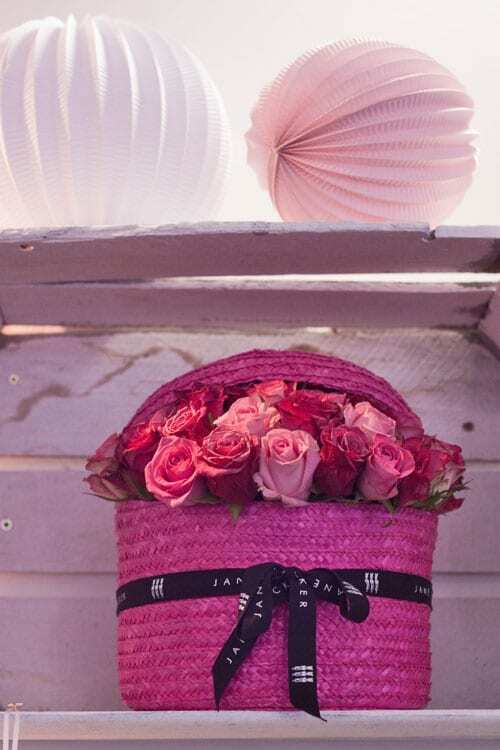 The Jane Packer team were there with a lovely stand which included their signature hat box designs, which you can see pictured above and below. One of the main attractions for me at the show is the presentations that they hold in the Lifestyle Theatre. 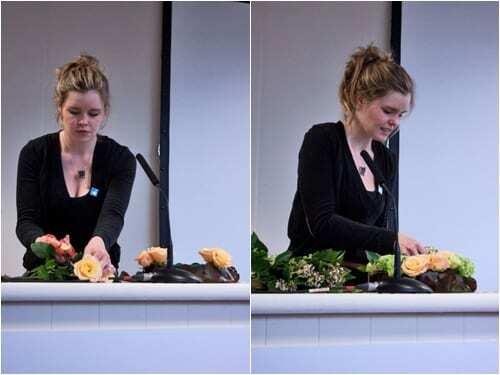 And I made sure that I arrived in good time that morning to see a fabulous ‘Spring Flowers’ demonstration by Jessica Hill from the Jane Packer team. 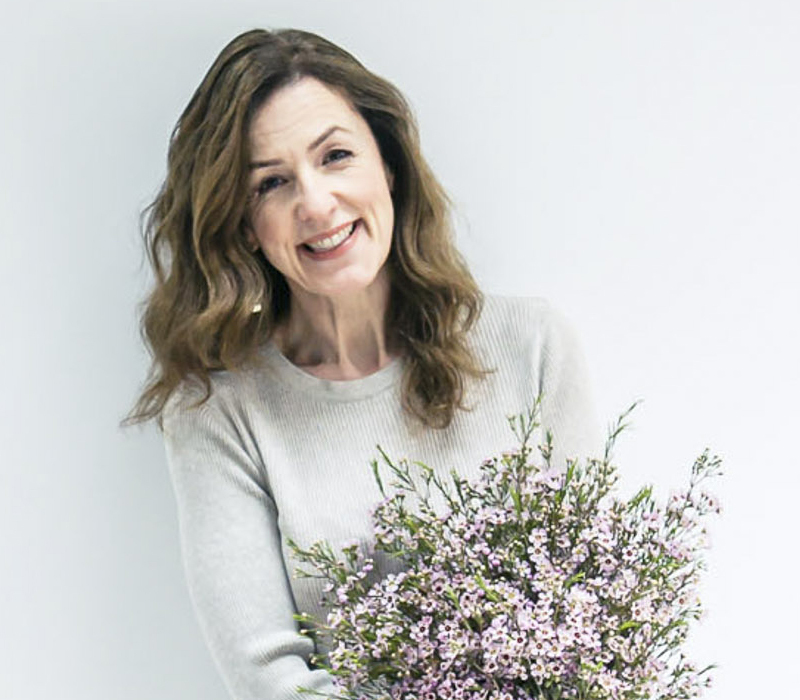 Originally from New Zealand, Jessica has been working as a florist for the last twelve years. 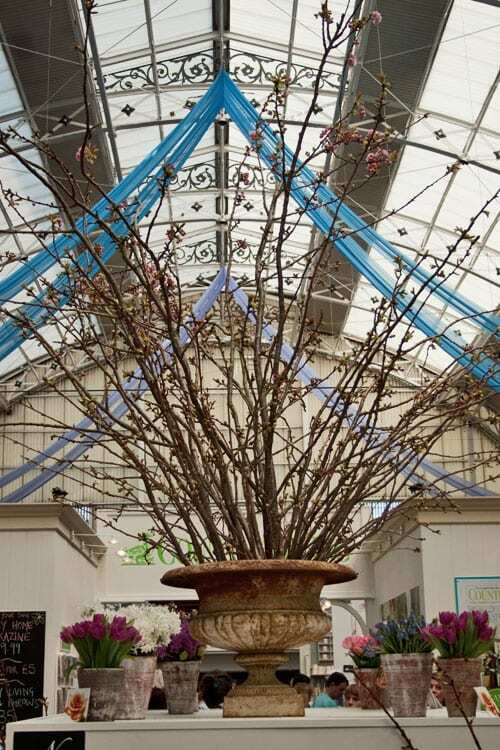 Her first design was a simple and inexpensive arrangement using iconic spring flowers…daffodils. As she pointed out, they can look lovely on their own in a vase, but sometimes it’s nice to do something a little bit different with them. 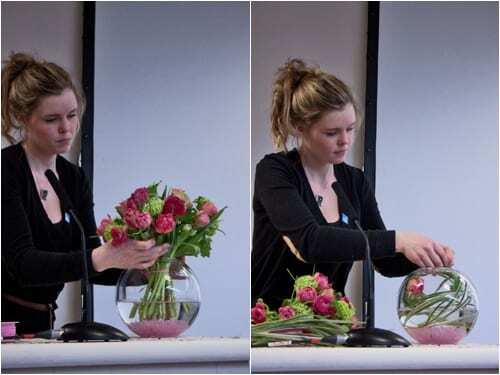 So, she showed us how to make a topiary arrangement by firstly lining a glass cube with moss. Then she took twenty or so stems of daffodils and holding them high up, arranged them head-to-head, keeping the stems straight. She secured the daffodils under their heads with a piece of pot tape, which is a waterproof tape. 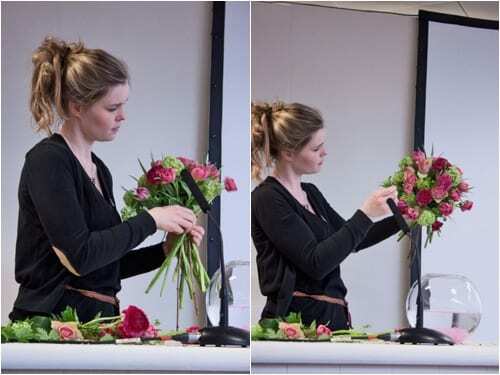 Then cut them to an appropriate length, secured them at the bottom with the tape, and placed them in the vase. 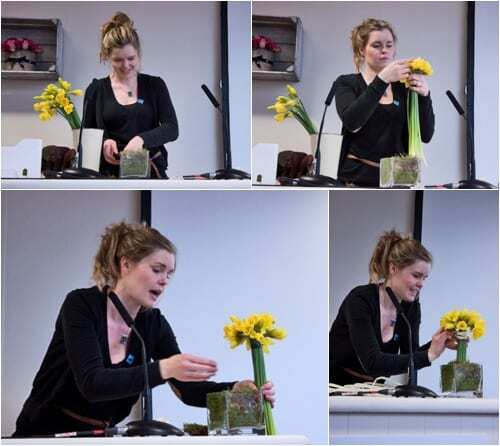 Jessica then put more moss into the cube to secure the daffodils in place and poured in water. She said that smooth stones could be used in place of the moss. Next up she made a lovely arrangement using a foam wreath ring. She started off the design by covering the sides of the ring with galax leaves. 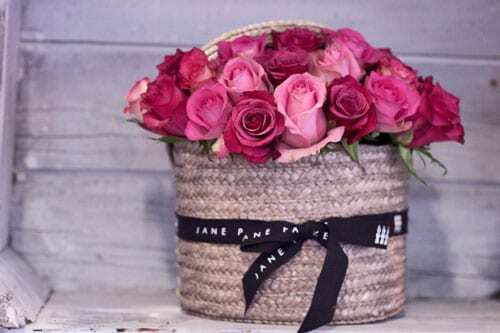 Very much in the Jane Packer style, she inserted the flowers and foliage in groups, starting with apricot/pink Almas roses, guelder rose, lisianthus and viburnum tinus. Then to hide the foam ring, she filled any gaps with moss. Jessica explained that as well as being perfect to hang on a door at a wedding, the design could also be used as a tablecentre. She showed us how by placing a storm lantern and green candle into the wreath centre. 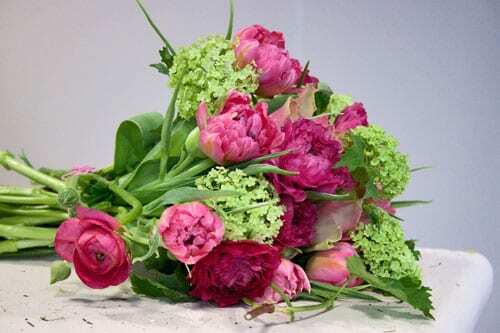 The last design she created for us was a stunning hand-tied arrangement of pink double tulips, La Belle roses and ranunculus, together with guelder rose. She tied the arrangement with pink cord and placed it in a goldfish bowl, the base of which she’d covered with pink glass chips. Then she also showed us how the same vase could be used for a simple, yet very effective, arrangement of tulips and swirled china glass. And suggested that three of these designs would look lovely placed down the middle of a long table. 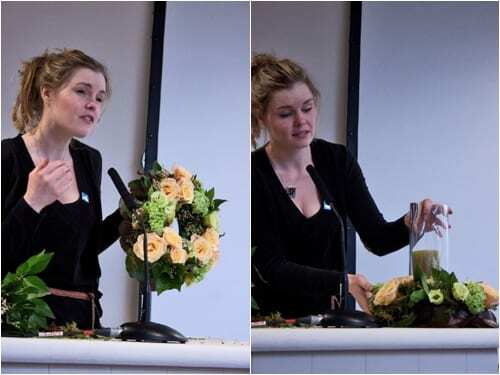 Jessica works at the Jane Packer Flower School and from the way she presented, you could really tell how very passionate she is about her career. 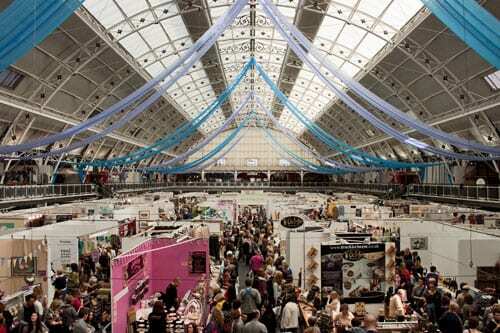 She’s demonstrating at the show every day at 11.30am, so do pop along if you’re visiting. I also attended Emma Jones of Enterprise Nation‘s presentation, ‘Turn your talent into a business’. Emma had lots of useful hints and tips about how to start up a business literally ‘from your kitchen table’. And it was lovely to catch up with her afterwards and hear her news. Another floral highlight from the show was the beautiful arrangements by Mathew Dickinson. 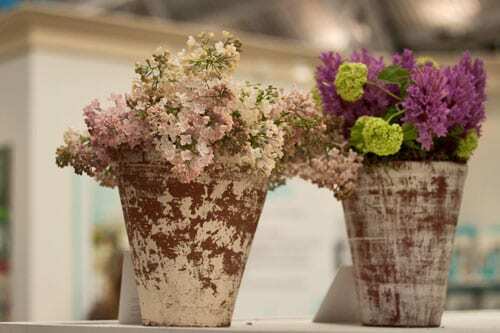 Gorgeous pink blossom in a huge urn was encircled by groupings of spring blooms in rustic terracotta pots. The show is on until this Sunday, 25th March and I highly recommend a visit. Over the coming weeks, I’ll be featuring some of the new floral-related designers I discovered. Oh…and whilst I was there it was lovely to meet artist Charlotte Hardy who was helping her mum, Jill Fade from Meadowsweet Flowers and Charlotte Macey who I’ve featured. And catch up with Abigail Mill and Kim from Moore Designs.